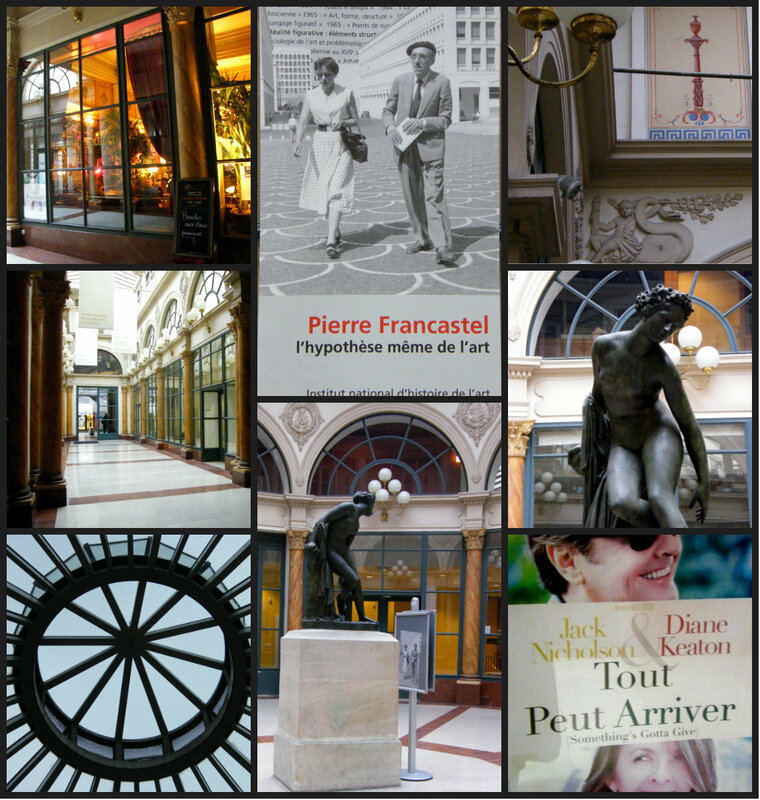 I had come across references to “Les Passages” in a Paris guidebook and decided to take a closer look at them during my last visit to “The City of Light”. So on a very wet and chilly spring day I set off on my Passages Walk. Between the late 18th and early 19th centuries the Right Bank included a network of 140 covered passageways – the fashionable shopping arcades of the time. In a city without sewers, pavements or sheltered walkways, these arcades allowed shoppers to stroll from one boutique to another protected from the filth of the city streets. Today there are fewer than 30 left, some well-preserved with their original mosaic floors and neoclassical decoration. It was time to check them out and find out what it was like living in 19th century Paris. Starting from the Metro station Palais-Royal I headed east on Rue Saint-Honoré towards Place Colette and then turned left into Rue Jean-Jacques Rousseau to enter the Galerie du Passage Véro Dodat. This is one of the prettiest and oldest passages, built in 1823. It has mahogany panelling and an old-fashioned floor of chequered black and white tiles, Corinthian columns and gas globe fittings (which have been converted to electricity). There are 38 identical boutiques with narrow arched windows surrounded by gilt edging including the beautiful window display of musical instruments in Luthier. Don’t forget to look up at the ceiling either as you will be rewarded with beautiful gilt framed 19th century murals. Retracing my steps towards the Louvre I took a detour through the Louvre des Antiquaires as it had started to rain heavily. It is a most extraordinary store of antiquities on three levels, with goods ranging from Eastern carpets to Baccarat crystal and delicate Sevres tea sets to incredibly ornate porcelain decorated grand pianos. A very interesting complex to while a way a few rainy hours, but definitely not a place to take children! Being a little too expensive for my pockets (and anyway, where would I put that enormous baby grand?) I exited onto Place Colette and retraced my steps towards the Comedie-Francaise (interesting metro design) next to the Palais-Royal with its Revolutionary history (another story entirely) and entered the Jardin du Palais Royal where elegant 18th century arcades (1786) surround a very peaceful garden. Although not strictly passageways they are considered to be the prototype of what was to come. 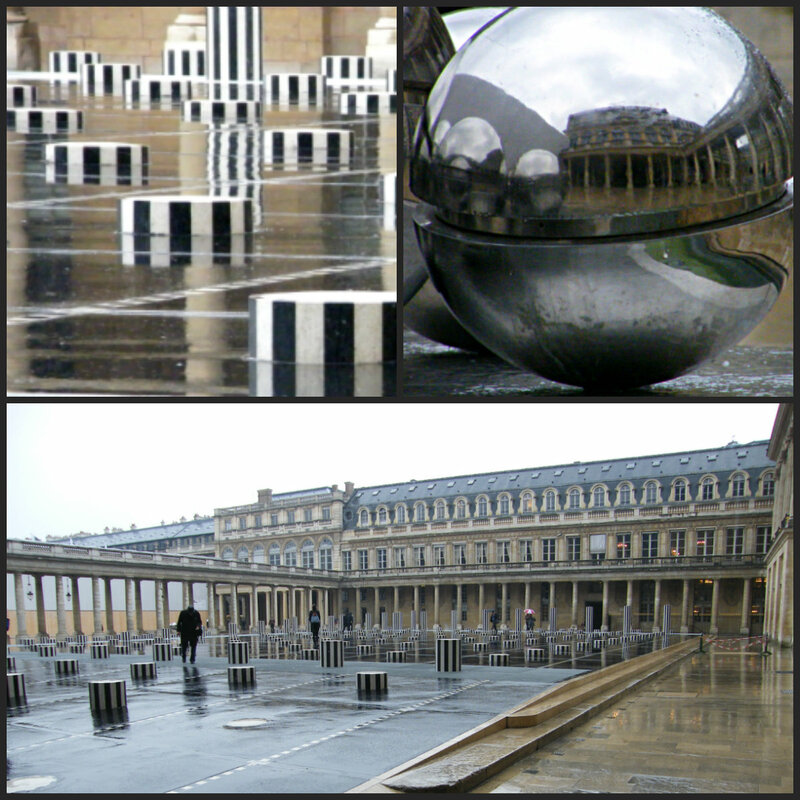 The first thing to grab your attention is the 1986 Daniel Buren conceptual sculpture – 280 prison-striped columns oddly placed in the main courtyard – Cour d’Honneur. I was fascinated by one gentleman who was busy measuring the distance between the columns, despite the pouring rain. I have no idea what they represent, or indeed what he was doing, but I did spend rather too long photographing them at various angles. 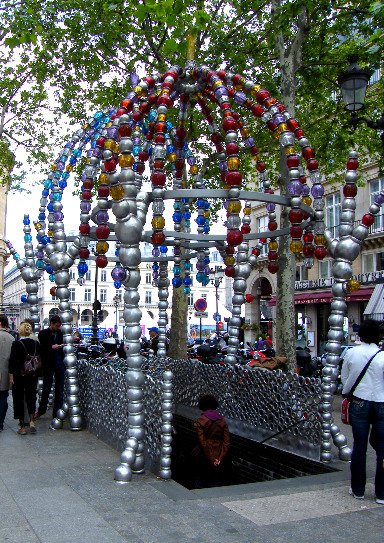 Also in the garden near to the central pond were some other contemporary sculptures that resembled screwed up silver balls of paper with currencies of the world engraved on them. I don’t know what they represented either! 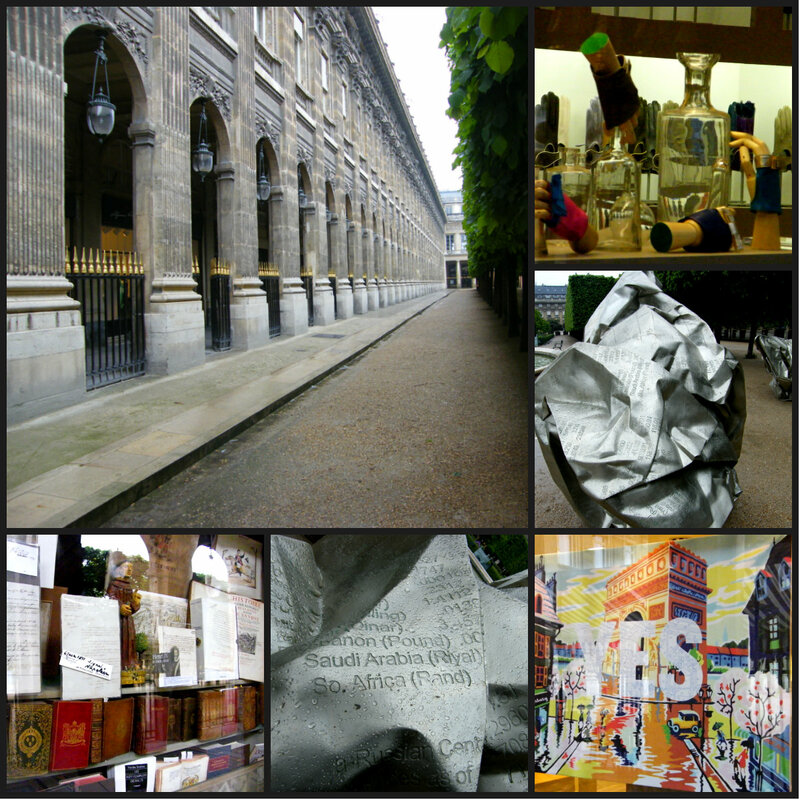 It’s always worth looking to see what modern sculptures the Palais Royal and its Jardin are exhibiting. As it was raining heavily at this stage I was grateful for the covered arcades that rim three sides of the garden and still have their mosaic floors and 180 electric lamps. They contain some delightful restaurants and a mix of fashionable and kitsch stores. Search for “Guillaumot Graveur-Heraldiste” – a coat of arms engraver, which has been here since 1785 and is filled with musty old books and documents. In the window are letters from Henry IV and Napoleon though they must be pretty difficult to read, even if you can read French! There are also a number of designer clothing and shoe shops and a fascinating arty display of gloves (yes, that’s right – gloves!) plus a brand new Stella McCartney store which was about to open (2010). You have to wonder what the rates are in a place like this! On the left side you can find an interesting shop L A Oriental, containing a window display of hundreds of pipes and other smoking paraphernalia. After a brief walk to look at the central pond and garden, which is probably very pretty when not raining (and I suspect a wonderful place to sit and watch Paris’s bourgeoisie), I left the garden at the opposite end from where I entered. I made my way to 4 Rue des Petit-Champs to find the Galerie Colbert and the Galerie Vivienne. These were both built in the 1820s and are probably the best known passages, squeezed in between the Bibliothèque Nationale and the place des Victoires. Both are very elegant with neoclassical reliefs and mosaic floors and with skylights and potted palms they are perfect for rainy-day browsing. 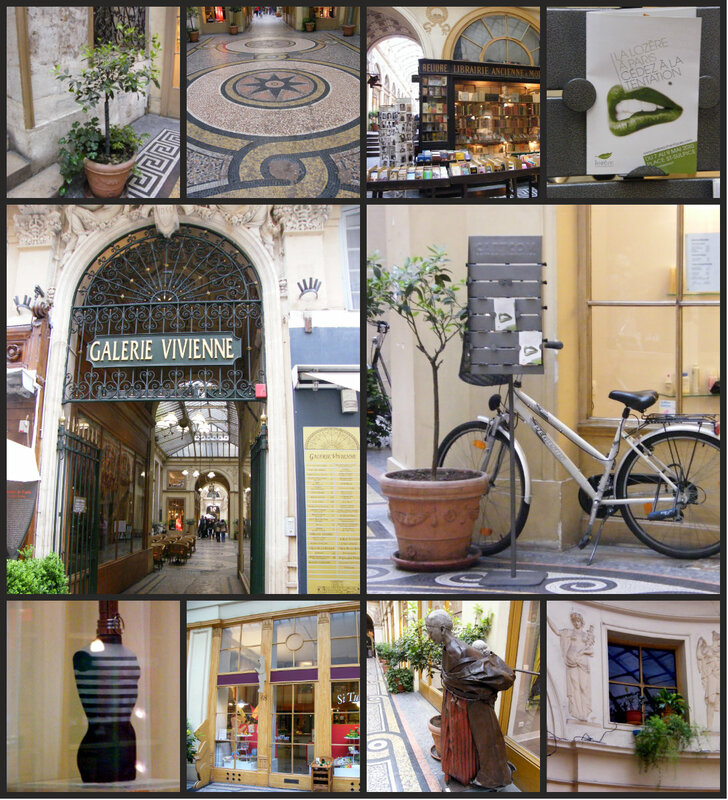 Elegant Galerie Vivienne (1826) opens onto three streets. Vivienne decorated with bas-reliefs of snakes (signifying prudence), anchors (hope) and beehives (industry) is the most well-known passage and the poshest of the passages. It has a commercial spirit and boasts Jean Paul Gautier’s first boutique; Legrand Fille et Fils wine shop – selling not just wine, but all means of wine-related paraphernalia; Wolff et Descourtis with its silk scarves; the Librairie Ancienne & Moderne selling antiquarian or rare arts books; L’Atelir Emilio Robbo Studio – a very beautiful flower shop; many contemporary design shops and an intriguing toyshop “Si Tu Veux” where giant teddy bears guard the door. The high glass covered roof and domes make this place feel very light and airy; the glorious mosaic floor draws your eyes downward and even if you are not interested in shopping it is a fascinating place to wander around with a camera. 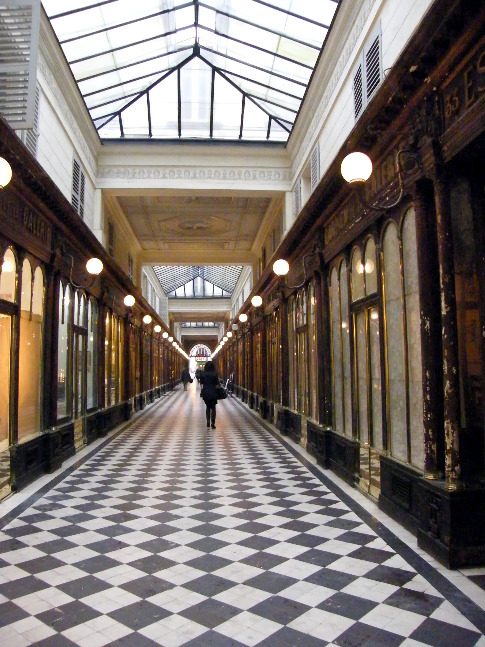 Galerie Colbert (1826) is more sophisticated, and less commercial and has its own entrances. The main attraction is the glass dome and rotunda. Colbert is now occupied by the Institut National de l’Histoire de l’Art (University of Paris) but can be visited and often holds exhibitions in its gallery. It also houses Le Grand Colbert, a splendid period restaurant with high ceilings and gleaming brass fixtures which has its own entrance on Rue Vivienne. It serves lunch, afternoon tea, dinner and late supper for theatre goers at the nearby Comédie Francaise. It was also the restaurant featured in the film “Something’s Gotta Give” starring Diane Keaton and Jack Nicolson in 2003. Leaving the Galerie Colbert behind I made my way south along Rue Vivienne, to rue Petits Champs turning right. At 40 rue des Petits Champs you can find the entrance to Passage Choiseul (1828) which is rather more ordinary than the previous passages with second-hand clothing shops, restaurants and second-hand bookshops. It is decidedly down-scale! Exiting Passage Choiseul turn right on Rue St Augustin and follow it to the end then turn left past la Bourse (the stock exchange) and a marvellous chocolate shop on the left (above). Turn right into rue St-Marc and at no 10 you will find the oldest maze-like Passage des Panoramas (1800). It was the first passage to be lit by gas (1817). 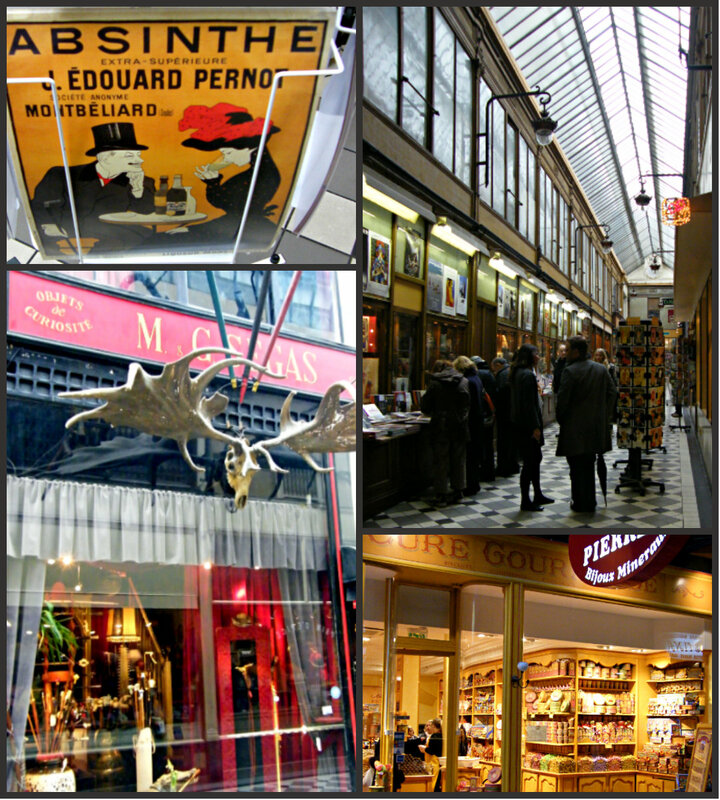 Five separate arcades converge here with around 100 shops and Jean-Paul Belmondo’s Théatre des Variétés. This passage is not as glamorous as some, but does contain lots of shops, coin and stamp shops, wine merchants, restaurants and antique shops and is very busy, and also not very light, a combination of which makes taking photos rather difficult. The increase of restaurants and the spill of tables and chairs into the passages also make it difficult to move through easily. If you follow the passage to its end you will reach the Boulevard Montmartre. Cross over to enter Passage Jouffroy (1846) opposite, which was the last passage to open in Paris. It is quieter and prettier with tiled floors and contains two hotels including Hotel Chopin; a wax museum – Musee Grevin; several interesting toyshops; La Cure Gourmande selling an amazing range of biscuits, sweets and chocolates; shops selling oriental rugs; the bookshops Librairie du Passage with lots of old postcards and Paul Vulin a movie-memorabilia store and M&G Segas where Toulouse-Lautrec bought his walking sticks. Now cross over rue de la Grange Batelière and enter the Passage Verdeau the last and most modest of this section of passages, which contains Libraire Roland Buret, a haven for collectors, with antiques, classic film posters and vintage posters; Verdeau a photography shop for collectors, a lovely little bistro and Livre Mon Ami – a pretty bookshop. All this walking may make you hungry. Stop off at A Priori Thé in the Galerie Vivienne which has an excellent atmosphere and wonderful cakes and hot chocolate or at the end of the Passage des Panoramas La Creperie serves delicious ice-cream sundaes and does very good galettes with authentic cidre in earthenware jugs. A nice escape to Brittany in the heart of Paris. There are many other bistros and restaurants you may like to try along your walk. 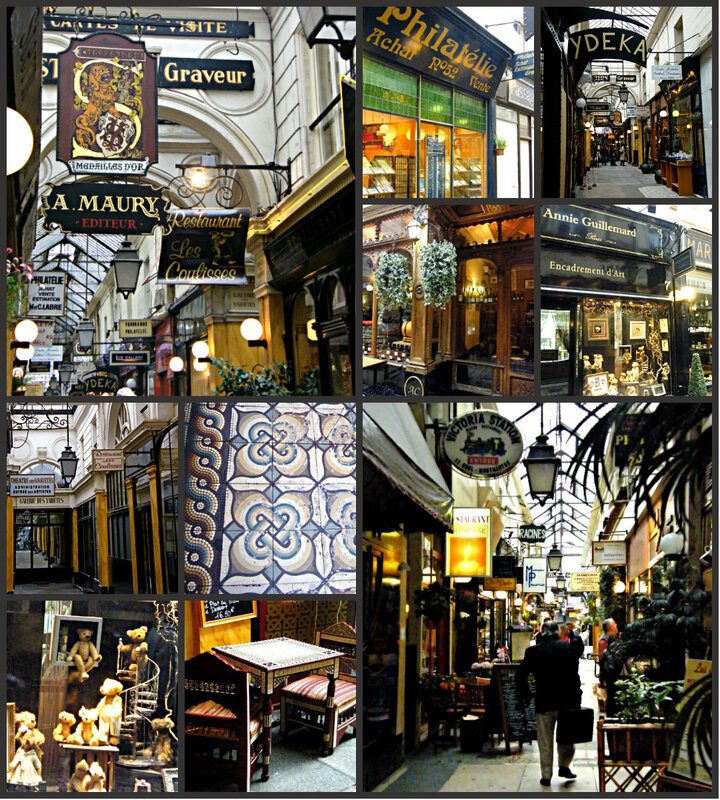 This is an interesting walk to do on a wet and chilly day – my favourite passage has to be Vivienne because of the beautiful mosaic floors and other architectural details and the wonderful variety of designer shops, though Panoramas is probably the most eclectic. I’m glad to say that I resisted temptation to part with some serious cash and other than my metro tickets and a café crème: it was a cheap and pleasurable way to while away a few hours. Sorry for the delay in replying, I am only just getting used to the commenting system on here! Thank you for stopping by and I hope that you get to see some of those Passages in Paris. They are quite lovely. I hope you do make it to Paris. I feel it is time to have another visit too! The Passages were perfect on a rainy day, I guess they’d work just as well if it is too hot. Exactly what I was thinking!! Tarnation! I’d totally forgotten about your rainy day tour. 😦 You should have ‘nudged’ me just before I went. I haven’t been to Paris for years and I’ve never seen the passages, thanks this is lovely! They are a great place to explore on a wet day! Ah, I had forgotten that this would ping you as it was already published, it it actually meant as a reblog tomorrow, but you have seen the post way back so that’s OK. I did wonder. 🙂 What have you done to your back, anyway? Over zealous gardening? Jude this is a fabulous walk . . . .I want to hop on a train right now to Paris! This is fascinating – I had no idea about these wonderful passages. Like Becky, I want to go to Paris right now and explore them! What a tempting trip! It’s a definite plan for when I get the chance to visit Paris. Great tips on what to do when it’s raining in Paris, Jude. And lovely shots to accompany the tour as always. Looks like we’ve walked some of the same passages. Great for window shopping, window photography and appreciating the history. I avoided the interior cafes though. It was sunny and I preferred the outdoor cafes. Like you, I think I would have been mesmerized by those striped columns – rain or no rain. All those wonderful lines! And that subway entrance with all the coloured bubbles! You managed to pull off a great walk in the rain! It wasn’t great weather but fortunately I was indoors most of the walk. Lots to see there! Thanks for sharing on Jo’s Monday walks. That is how I came to be here!